The Cries of London: Do you want my matches? Plate 4. My other weekend antique stop was the Antiques Center of Yarmouth in West Yarmouth, Mass. There were many treasures hidden amongst their large selection (including a handfull of 18th century items less than $100). I couldn't leave without something, so I chose this $25 print. If I owned a smart phone I would have been scouring online museum databases to confirm it, but I'm not that techy. I ran the risk of buying it. 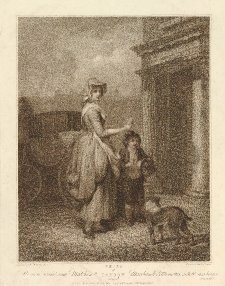 The museum describes this as, "Plate 4, a young woman, holding matches in her hand, standing in profile to right and looking back towards the viewer; with a small boy, who also carries matches, standing in the street, carriage in the background." I found a second listing for this print (Accession Number 1948,0315.4.1). While there is no image, I believe it's probably similar to mine because it's described as being "hand coloured." The latchet on her right shoe is not secure and has fallen open. (Perhaps these were originally shoes worn by a taller woman and they do not fit well?) What an easy detail to replicate for a lower class / working class impression! I love the little boy's slouching stocking and I must confess I'm kind of jealous of his cool basket. Her hat is keeping with the late 18th century fashions by having more of a crown, though the rim is much smaller than I often associate with this era. Perhaps it's dropping in front because it has been worn in the rain? I'm also intrigued by the ribbon securing the hat to her head. Is this sewn on and regularly worn in this manner...or is this a make shift way of securing her hat because it's a windy day and she didn't have a hat pin handy? My market basket is machine sewn, but the leather trim at the top is hand sewn. Could it pass as an 18th century accessory? I'm always dragging an armful of stuff around at events, maybe I'll dag this one to the next event.